Mrs. Lincoln's Inkin: Just Being Me! Hello stampers!! Happy day to you! I hope you all had a wonderful weekend. Mine was spent in my craftroom. I was so excited to be able to have the windows open and the smell of the crisp spring air and fresh cut grass. It was an amazing time!! Now on to today's share. 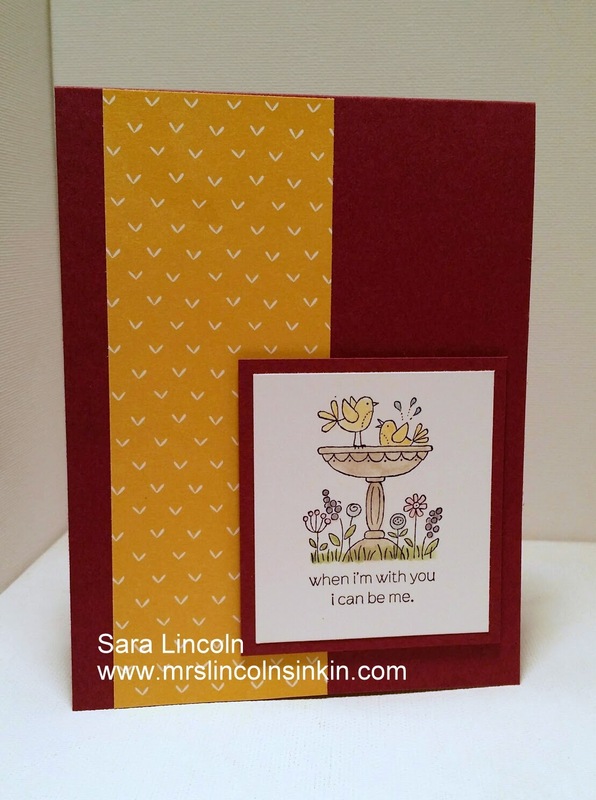 This is a super simple card using the For the Birds stamp set. This is a set that is on the retiring list. I must admit, I got this set forever ago and have probably only used it a handful of time. But I just thought it was so cute! The base of my card is average size and is in Rich Razzleberry. I used a piece of Lullaby DSP (also on the retiring list), this pattern reminded me of bird beaks, lol. This is the item that I am showcasing today. The cute little birds. Don't forget to check out the complete updated retiring list HERE. Accessories are sure selling quick so don't wait too long to stock up. To allow everyone a chance to get some of your favorite items you can order your favorite items at up to 50% off. But, items will only be available until June 2nd and it's only while supplies last (on accessories), stamps will continue to be made until May 26th due to the high demand.